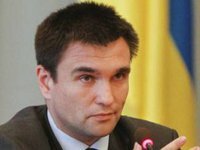 Ukraine will not allow Hungary to hand out its passports to Ukrainian citizens and will continue the dialogue with Hungary on the extension of the transitional period of the law on education, Ukrainian Foreign Minister Pavlo Klimkin has said. "The consequences [of the video on the Internet about the procedure for issuing Hungarian passports to Ukrainian citizens] will be very simple. We will sit with the Hungarians again. We will talk about the extension of the transitional period of the law on education. This is important to them. We have the subjects of a conversation with the Hungarians, but in principle there is a red line - they will not give out citizenship for no particular reason, and they will not manipulate," Klimkin said live the 1+1 television channel early on Friday. According to the minister, he plans to discuss with his Hungarian counterpart "how Hungary finances Ukrainian citizens" of Hungarian descent. He said that 22,000 Ukrainian citizens of Hungarian descent received assistance from Hungary last year alone. "This means that one in five, every family receives this assistance," Klimkin said. He also said that Ukraine is currently checking "how, in what amount of money, through what mechanisms" this assistance is being provided. While commenting on the video confirming that Hungary issues its passports to Ukrainian citizens, Klimkin said: "Some people think that the problem with this video is only in the distribution of citizenship, but the problem is in this call [...] In fact, this is a call for violation of our legislation and manipulation." According to him, Ukraine does not have a "clear strategy" for Ukrainian citizens of Hungarian descent. "We do not really have a clear strategy on how to support our Ukrainians of Hungarian descent [...] We must be present there [...] We must understand them and help them, not the Hungarians, but we, and in extreme cases we, together with the Hungarians, but not the Hungarians themselves, as is happening today [...] We must do it together and not allow Hungary to do it itself."